Almost 1500 calories a meal at 3 meals a day! 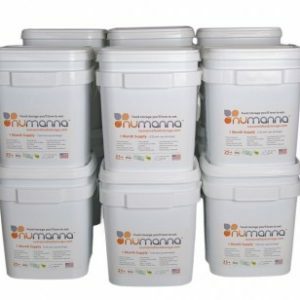 The first and only NuManna buckets with real meat for the protein you need. 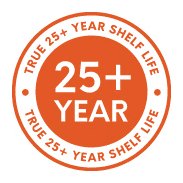 The first company to offer Hormone Free Milk for long term storage. The best tasting food storage on the planet! 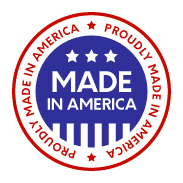 We are once again offering the highest quality food storage we can find. 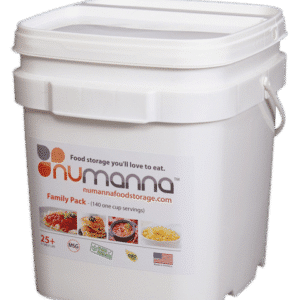 We went to NuManna because they offer the best tasting and most nutritious food storage available anywhere. We liked what they had to offer but like all other food storage their buckets did not have the protein that we felt is essential in times of duress. So we asked them to make us some meals and buckets with chicken and beef, AND BOY DID THEY DELIVER. Sweet Habanero Beans & Beef and Hearty Beans & Beef are so tasty you could put them on the dinner table tonight and your family will gobble it up! When Steve’s son ate the Potato Casserole w/Ground Beef he went in for thirds. 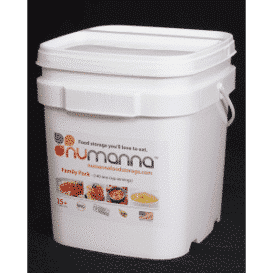 The Pasta Primavera Mix with Freeze Dried Chicken, Pasta Alfredo Mix with Freeze Dried Chicken and Enchilada Beans & Rice with Freeze Dried Chicken are the most popular NuManna meals and now full of protein. 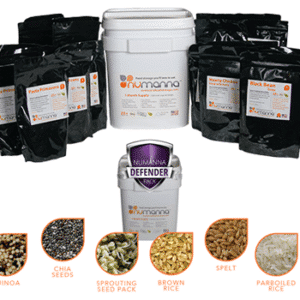 The best tasting and healthiest food storage and we have it for you right here. 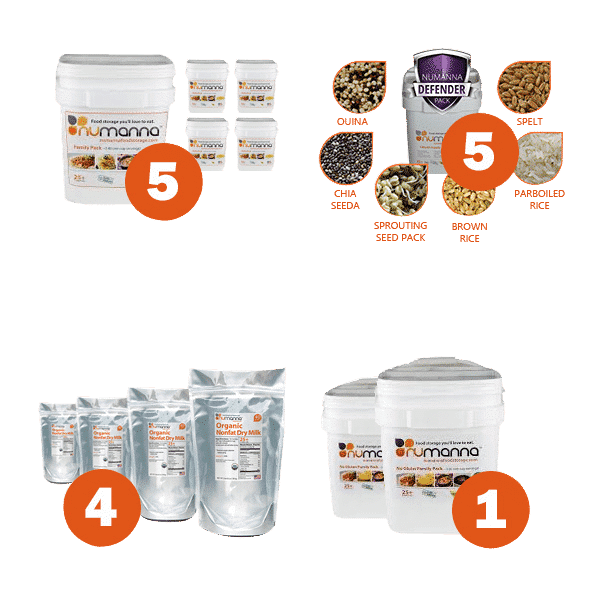 What makes NuManna so good for you? Just the stuff your body needs to thrive and nothing else. This package contains 5 Family Packs with meat, 5 Defender Packs with meat, 4 Hormone Free Milk 6 Packs, 1 Diced Chicken Bucket and 1 Ground Beef Bucket. Each Family Pack with meat bucket contains a total of 146 Servings (116 Lunch/Dinner servings, 30 Breakfast Servings). 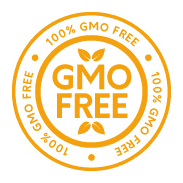 Each Defender Pack with meat comes with 126 servings of our traditional GMO-Free, Easy-Fix meals plus 74 servings of Organic Grains and Super Foods. Organic Quinoa – Considered the “most nutritious food in the world”, Quinoa is a key staple of many country’s diet and our Defender Nutritive Pack. Highly nutritious, packed with vitamins and protein, Quinoa is a fast and easy way to give your body what it needs in times of duress. Quinoa is easily cooked and Gluten-Free–it can be ground into flour, used just like rice and mixes well will other foods. Quinoa is high in magnesium – which helps relax blood vessels, resulting in fewer headaches for migraine sufferers and decreased risk of hypertension and stroke. It is also a good source of manganese, iron, copper, phosphorous, and riboflavin. Organic Black Chia Seeds – Chia is an edible seed that comes from a member of the mint family that grows abundantly in southern Mexico. In pre-Columbian times it was a main component of the Aztec and Mayan diets. Aztec warriors carried it as a survival food. It has been written one tablespoon could sustain a warrior for a whole day. Omega-3 fatty acids are abundant in Chia seeds, even more so than flax seeds. And it has another advantage over flax: chia is so rich in antioxidants that the seeds don’t deteriorate and can be stored for long periods without becoming rancid. And, unlike flax, they do not have to be ground to make their nutrients available to the body. Chia seeds are high in fiber as well as calcium, phosphorus, magnesium, manganese, copper, iron, molybdenum, niacin, and zinc. Organic Sprouting Seeds – The genesis of all life is contained in a seed. There are certain seeds which have been long trusted as nutritional additions to the human diet. As the seeds begin to sprout the young seedlings unlock the secret of life held within the seed. After a couple days of growth the plant is at its nutritional peak. The vitamin and mineral spectrum in a handful of sprouts is remarkable and are often mixed in with other foods. Just like Chia seeds, it doesn’t take much more than a spoonful to cascade nutrition into your body. 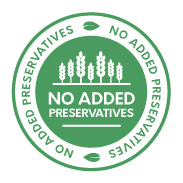 Because of the seed’s own preservative mechanism they store very well when packaged correctly. Using sprouting seeds is a remarkable and near irreplaceable addition to your overall food preparedness plans. Organic Brown Jasmine Rice – Rice provides up to 50 percent of the calories for half of the world’s population. Brown rice is not milled and unpolished. Therefore it retains the outer bran and germ layers of the grain and the vitamins, minerals, fiber and even fatty acids that are housed there. Brown rice is loaded with manganese, with one cup of cooked brown rice providing almost 90 percent of the Daily Value. The oil found in the bran of brown rice has also been shown to have special cholesterol-lowering benefits. Parboiled Rice – As the name indicates…Parboiled Rice is partially-boiled rice. Because it is already cooked to some degree it is easier and faster to prepare. Just like white rice eaten all over the globe, NuManna added Parboiled Rice as a fast and extremely flexible staple to mix with existing meals to increase calorie count, nutrition and overall servings. Parboiled Rice is a fantastic edition to your overall preparedness. It is a perfect caloric addition to all our soups and chili’s. Organic Spelt – A nutritionally rich relative of wheat…Spelt has a recorded history of more than 7 millennia. It is one of the first grains known to be used for bread. Since its domestication, spelt has served as a staple food around the world, from the civilizations of ancient Greece and Rome to those of medieval Europe. Spelt provides a broader range of nutrients than other members of the wheat family; it’s high in manganese, vitamin B2, niacin, thiamin and copper. Spelt is particularly heart-healthy, as niacin protects against numerous cardiovascular risk factors (such as high cholesterol and platelet aggregation). Spelt’s fiber helps reduce total and LDL (“bad”) cholesterol. Because spelt contains less gluten and is more easily digestible than wheat, many people with wheat sensitivities or allergies find that they are able to tolerate it. Always consult your doctor when considering food allergies.